This is my first ever outfit project review post! I love dress especially once that include bright colours. Clothes have always been my passion and desire. There's nothing like buying a new outfit or top and feeling your best in it. I'll never understand people who don't care about clothes or shopping. Clothes to me are so fun and they express who and what we are. I'm teaming up with GoJane to share this dress with you all! GoJane is a fashion forward internet boutique that sells affordable shoes, clothes, and accessories. Plus, they have the best deals with many options for all personalities and styles. They always have the latest trends and most importantly, offer them at affordable prices. GoJane is an online clothing website that sells very affordable items for women. Whether you're looking for a cute top, great fall boots, or dangle earrings, they have it all and more. The clothes are very trendy and what you'd see in a department store but cost half the money. Over all, GoJane is a great store to check out for everything fabulous! They offer a lot of cute and affordable clothes, shoes, and accessories that you'll surely have a hard time choosing a favorite. 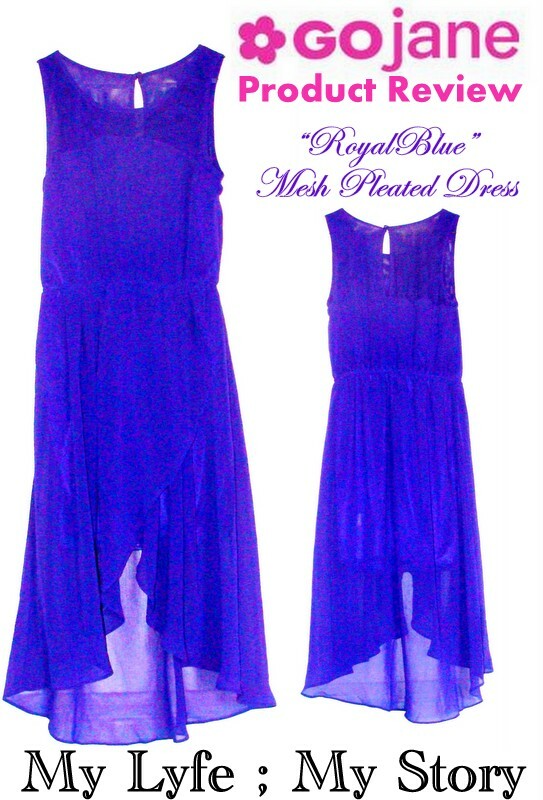 For the product review I chose the do a review on the "Royal Blue" Mesh Pleated Dress. When I first received the package I was really excited and I still am. So far, I wore this dress initially twice, plus I did more that ten to twenty trial and error to find the perfect matching jewellery pieces. I am really happy with the dress. The colour is stunning and make me stand out in the crowd. Furthermore, when I wear this specific dress I feel as if all eyes are on me. Not only because of the colour of the dress, is also due to all the details, which makes the dress really unique. The small details makes this dress pop. Also, it follows the asymmetrical and the high low trend, yes two in one. Plus, the quality of the dress is soft comfortable and soft. To be frank it doesn't even feel as if you are wearing a dress, since it that comfortable.Plus, the material is not too silky with a natural shinny look. The the price is very affordable and the whole online boutique is really affordable. Plus, the shipping was pretty fast and I was given a tracking number so I knew where the package was and when I should expect them to come in the mail. I would definitely recommend this company, Go Jane to everyone and anyone. A sample of these products were kindly sent to me for review purposes. I am not being compensated in anyway, shape, or form. The reviews on My Lyfe ; My Story are honest opinions, based on my experience/knowledge with each product mentioned.